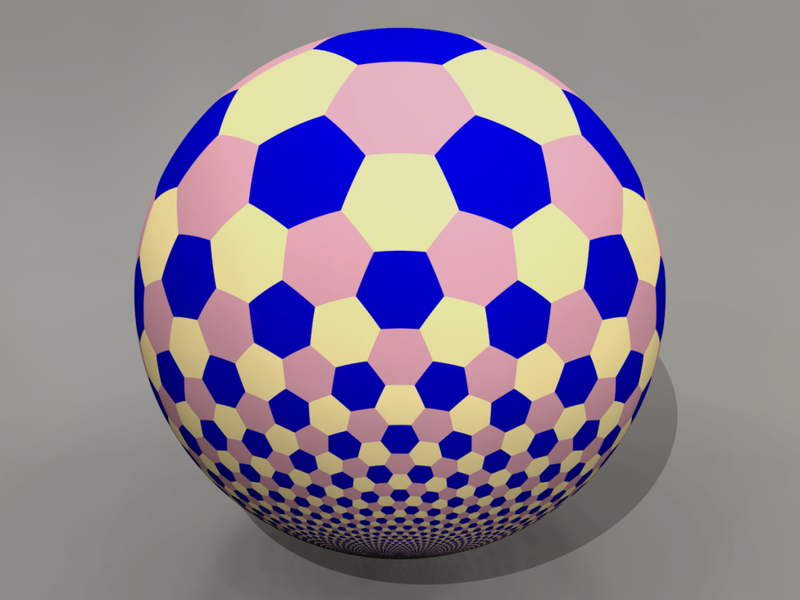 Is it possible to have a spherical object with only hexagonal faces? If so, what would be the most efficient algorithm for generating spheres with different number of hexagonal faces at whatever interval required to make them fit uniformly or how might you calculate how many hexagonal faces are required for each subdivision? No, not even if we permit non-regular hexagonal faces. (We do, however, preclude hexagons that are not strictly convex—where interior angles can be $180$ degrees or more—since those permit degenerate tilings of the sort Davd K mentions in the comments.) The reason is more graph-theoretical than geometrical. But if $F+V-E \leq 0$, then it is impossible that $F+V-E = 2$, so no solid can be composed solely of hexagonal faces, even if we permit non-regular hexagons. If we now restrict ourselves to regular faces, we can show an interesting fact: Any solid with faces made up of nothing other than regular hexagons and pentagons must have exactly $12$ pentagons on it (the limiting case being the hexagon-free dodecahedron). or just $F_5 = 12$. I've heard tell that any number of hexagonal faces $F_6$ is permitted except $F_6 = 1$, but I haven't confirmed that for myself. The basic line of reasoning for excluding $F_6 = 1$ may be as follows: Suppose a thirteen-sided polyhedron with one hexagonal face and twelve pentagonal faces exists. Consider the hexagonal face. It must be surrounded by six pentagonal faces; call these $A$ through $F$. Those pentagonal faces describe, at their "outer" edge, a perimeter with twelve edges and twelve vertices, which must be shared by a further layer of six pentagonal faces; call these $G$ through $L$. There cannot be fewer than this, because the twelve edges are arranged in a cycle of six successive pairs, each pair belonging to one of $A$ through $F$. No two faces can share more than one edge, so the twelve edges must be shared amongst six faces $G$ through $L$, but "out of phase" with $A$ through $F$. However, these pentagonal faces $G$ through $L$ cannot terminate in a single vertex—they would have to be squares to do that. Hence, they must terminate in a second hexagon. Thus, a polyhedron of the type envisioned cannot exist. Likely the above approach could be made more rigorous, or perhaps there is a more clever demonstration. If a compromise is acceptable, the $2p, 4p, 8p, ... $ subdivisions of each side of an icosahedron in Buckminster Fuller domes leave behind 12 pentagons at each of its 12 vertices. 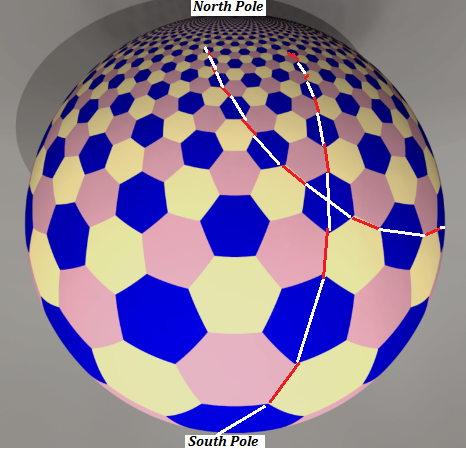 Else, possible by means of a stereographic projection of a flat regular hexagonal net (a node of which touches south pole and other nodes/junctions connect to north pole), the curvilinear hexagon boundary cells shrink to zero towards north pole according to standard stereographic scaling. They can be seen on POV Ray image provided by user PM 2Ring below. A part of spiral has been traced connecting opposite vertices of some hexagons. It is a collection of log spirals centered at south pole that isogonally ( i.e., conformally) project to rhumb-lines (loxodromes constant inclination to meridians at $\pm \pi/6$) with corresponding latitude circles drawn. I could make an image later if you wish to see. Since these loxodromes are not overtly seen on the above image, some segments are indicated across some hexagon diameters. You can do it if you allow your sphere to have a hole through it, i.e. be a torus. See image here. Then the Euler characteristic, as described in Brian Tung's excellent answer is 0, not 2. You might also be able to do it for non-convex polygons; convexity is a requirement of the Euler characteristic. See, e.g., the octahemioctahedron. I couldn't find one with just hexagons though. Not the answer you're looking for? Browse other questions tagged geometry graph-theory polyhedra or ask your own question. Is it possible to imitate a sphere with 1000 congruent polygons? How do Equally Sized Spheres Fit into Space? What is the most efficient shape for tiling curved spaces? What 'uniform' shapes can be used to build an approximated spherical object?